Our key learnings this week in CEP 810 revolve around how to integrate technology into the classroom and what technologies to integrate. Our objective was to write a lesson plan that expected students to design, create, inquire, problem-solve and/or evaluate in some meaningful way associated with my curriculum and to integrate at least one digital technology into that lesson. In our readings, we learn that Thomas and Brown (2011) believe that as a result of the inevitable changes that are occurring in our learning structures due to the information overload, students need to learn to locate information and express their learning in multiple contexts. Hobbs (2011) takes digital literacy a step further by detailing 5 competencies ranging from Access, the ability to locate information and share it with multiple audiences, to Action, the ability to collaborate with others to solve problems at a world-wide level. As a teacher librarian, these skill sets are at the core of my curriculum. My district is in the process of implementing Universal Design for Learning (UDL). UDL is a framework that implements flexible learning environments to accommodate student differences. At the center of UDL is strengthening Tier 1 core instruction so that students are not pulled out, but are supported in their classrooms. For this reason, my lesson plan is based on the UDL model of providing students with multiple Means of Representation, Multiple Means of Engagement and Multiple Means of Expression. As such the technology tool I am integrating is not the centerpiece of the lesson, but rather one of the choices that students may make. This lesson comes in the middle of a research project with my second grade students. We have spent our time to this point gathering resources and taking notes. We are just beginning to organize our information. Research is still a new skill for these students, so the classroom teacher and I are scaffolding the writing process by having students make mind maps of the information they have collected. As a lesson introduction, we will be reviewing main idea and supporting details. We will then practice making mind maps using a variety of tools ranging from pre-made templates to the LucidChart app in Chrome. Students will then be able to choose the format that they are most comfortable using – template, free form poster with Post-its, or LucidChart – to complete the map of their information. I chose the LucidChart Chrome app as my technology piece for this lesson because it is free and integrates with GoogleDocs. In the end I also included VoiceNote, a speech to text app that also integrates with Chrome for those students who have difficulty with getting their thoughts down on paper. Thank you for reading and I welcome any feedback. Hobbs, R. (2011). Digital and media literacy: Connecting culture and classroom. Thousand, Oaks, CA: Corwin/Sage. Thomas, D., & Brown, J. S. (2011). A new culture of learning: Cultivating the imagination for a world of constant change. Lexington, Ky: CreateSpace?. This is the final blog post in a series of three on the networked learning project I have been doing in CEP 810. Through the course of this project, my classmates and I have been learning a new skill through YouTube videos and various online help forums. Our essential learning for the project has been to familiarize ourselves with the variety of “networks” available on the web and how we can use those networks and other digital tools to learn. Over the course of these four weeks, I have accessed an on-line network of knitters to teach myself the skill of knitting a scarf. Some of these knitters share their knowledge through the creation of video tutorials, others by answering the questions of a novice on a help forum. Through these interactions, they share their passion and knowledge with those of us who do not share their experience base. As a result, I have begun the journey to being a knitter by learning the basics and completing my first project. As a learner, this type of learning is effective for me. I use it frequently when I am working to solve technology problems or learn a new piece of software. Google is a perfect example. As I went through the process of becoming a Google Educator this summer, their videos and help forums were the easiest and most effective way to learn the content. I believe networked learning is a fantastic tool to have in your educator’s toolbox because video and “ask an expert” situations can be such a powerful means of engagement for some students. It is not an all students all the time kind strategy, but can be very effective in specific learning situations such as learning a new technique or trying out a new skill. I do not see myself using this technique much for students in the near future as my district has blocked both YouTube and on-line forums due to the potential for negative interactions for students. As a member of the district technology team and the Library Media department head for the past six years, I have been actively working to have those filters removed, but have not had much success. I am hoping some changes in my district will enable teachers to use these effective tools soon. I do use video tutorials that I have created with my students for things like using a new online tool or searching for titles on our library catalog, but they do not have access to that wider network of experts to answer their questions. Overall, I think this project was a good experience for me. I learned a new skill, and was forced outside of my comfort zone by asking questions in a help forum about a topic for which I had very little background knowledge. I am looking forward to some changes in philosophy in my district soon so I will be able to introduce my students to the networks that will help them investigate their passions and encourage them to become lifelong learners at the same time. The video below represents my learning during the course of the project. I welcome any feedback on networked learning in general or my project specifically. In CEP 810, I am continuing to work on my networked learning project. My goal was to use YouTube videos and help forums to learn how to knit and ultimately knit a scarf for my daughter. My focus for the project has changed slightly. The goal now is to finish a test scarf for my son and then use what I’ve learned to knit my daughter one. This change comes from the fact that my son is far less picky about what he wears than my daughter, so my beginner mistakes will not cause anyone trauma. I have used the following tools for this project. 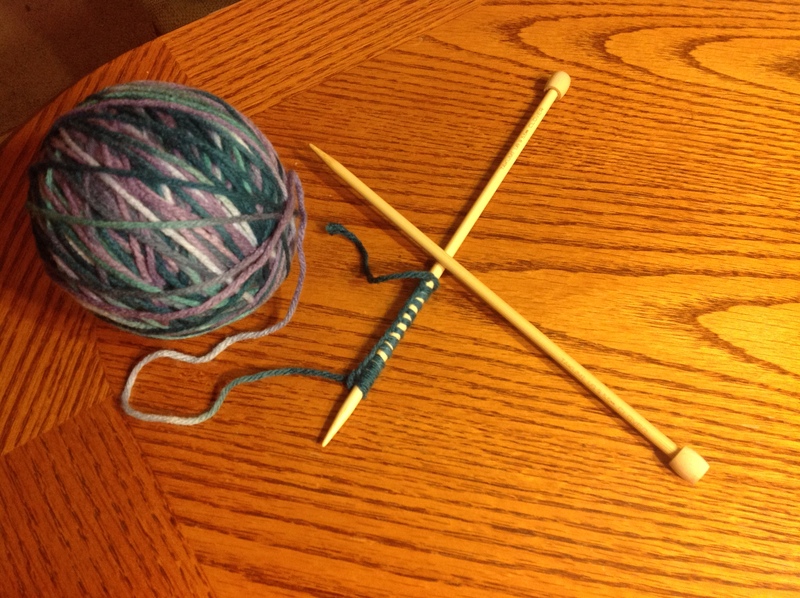 How to Knit – Absolute Beginner Knitting, Lesson 1 – Even if you’re clueless! To this point, the Knitting 101 videos have been the best resource for my learning. The instructions are simple and the videos are very well done when it comes to showing the stitches from different angles so that the viewer can fully understand what the steps are and what they look like. The narrator also comes off as very laid back and matter of fact which is calming. I have also found the Knitting Help forum to be a friendly and experienced source for answers to my questions. The biggest challenge that I have had to overcome is speed of work because the knitting process triggers carpal tunnel numbness and tingling in my right hand. I tried using the wrist brace I usually use when I have flare ups, but it is too clunky to use effectively. I turned to the help forums to see if anyone there had a suggestion for a better type of brace. No one really had a brace idea, but I did get some good suggestions about varying the type of stitch to relieve the pressure and about exploring some other forms of long needle knitting where there is less pressure on the hands because the needles wrap around the arm. For the short term, I am going to look into a less structured wrist brace than the one I am currently using to see if that curbs the numbness. I have been pretty happy with my progress this week. I can only work about a half an hour at a time before my hand goes numb, but even with that restricted amount of time, I am making progress rapidly and my scarf is looking like a scarf. The muscle memory is coming along and I am starting gain enough automaticity to knit while truly watching my kids swim and play soccer. It is motivating to see such progress so quickly. Next week, you will all see my completed first knitting project. If you have any questions or comments on my learning process or the scarf I am knitting, feel free to add them below. In CEP 810 this week, we are exploring productivity tools to help improve our workflow using David Allen’s GTD (Getting Things Done) program. The first step is to collect everything you need to do in one large list. I am a Google person, but I dislike the Tasks function. I decided to try an online to-do list creator called Wunderlist. Wunderlist has an easy to use interface, allows you to make multiple lists and has beautiful personalization options. I quickly listed all my projects, but then realized that it was a stand alone tool that couldn’t tie to my Google calendar. At that point, I kind of wrote it off, but as I started exploring the Wunderlist site, I realized that it has Chrome and Gmail/Google Calendar extensions. The Chrome extension is amazing. It allows you to put websites into a “Read Later” file. This option alone makes this a great tool for me. The Gmail/Calendar extension is a little clunky in Gmail, but works nicely in Calendar – opening up when you want it and closing completely when you do not. I was a little disappointed that even in the extension you cannot add things to your Google Calendar, but overall it is a solid tool that I will give a longer trial run. 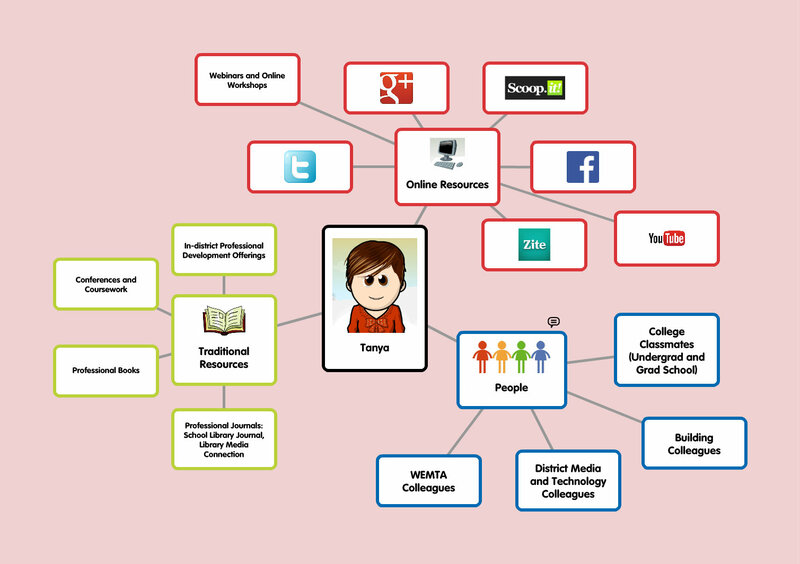 For CEP 810, we were asked to create a Popplet representing our Personal (or Professional) Learning Network. This is mine. It is broken down into three categories of resources – human, online and traditional. In my opinion, all three are equally important, but I find I am relying more and more on the digital PLN to keep me up to date. If you have any questions, ask them in the comments. I have always had a PLN. When I was a new teacher, my PLN consisted of my best friends from school. We spent hours on the phone talking about our new teaching jobs. We bounced ideas off of each other and provided the support that new teachers need. As I got more comfortable in my district, I started creating more connections with teachers in my building. I read my professional journals for outside viewpoints, but it was still a very narrow network. After grad school, my network got a little bigger. I would email my grad school friends or specialized professors when I needed ideas or expertise. I became active in professional organizations and started meeting more people with similar professional goals and interests. Then along came social media. My little PLN grew by leaps and bounds. I liked organizations on Facebook. I followed authors and educators on Twitter. I curated content through Scoop It and allowed others to curate content for me on Zite. Suddenly my little corner of the world became big and bright, and I remembered all the reasons I became an educator, and I shared that big bright world with them. Our newest assignment in CEP 810 is our Networked Learning Project. We need to learn a new skill using only YouTube videos and Help Forums. We were encouraged to be creative, step out of our professional selves, and choose something just for us. Choosing a skill I wanted to learn was much harder than I had anticipated. What I really wanted to do was learn to knit. I embroider and cross stitch, but I never learned to knit because my mom is left-handed and it was too difficult for her to turn it around to teach me. I looked at all the sample projects and saw lots of other people had chosen knitting. I wanted to do something different. I tossed around some other ideas – rosemaling, cartooning, some new software – but in my heart, I wanted to learn to knit. I decided my project will be to knit a scarf for my daughter. The first thing I did was determine what I needed. 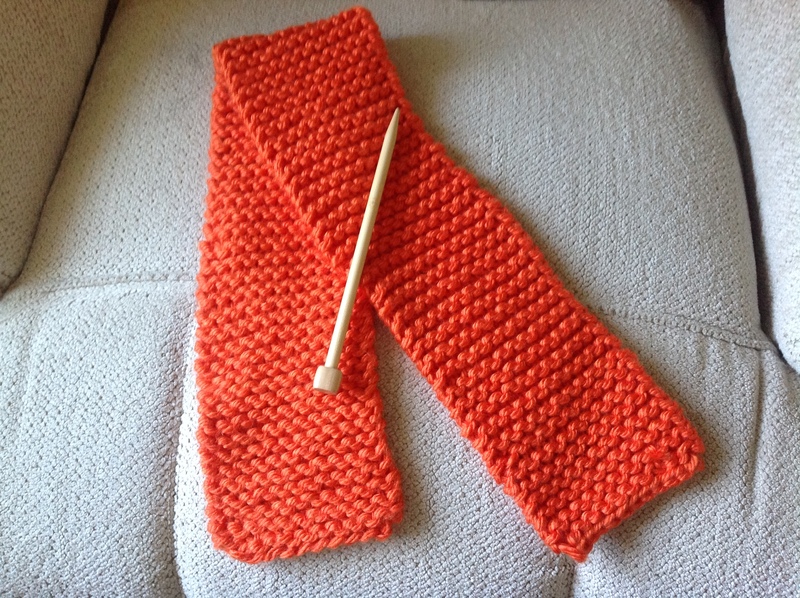 I found a pattern for a basic beginners scarf here, and purchased the recommended yarn and knitting needles. It was very easy to find videos for beginning knitters. I watched How to Knit – Absolute Beginner Knitting, Lesson 1 – Even if You’re Clueless! by ExpressionFiberArts first. It was very accessible and a good overview of the three things you need to know how to do in order to knit, but it turned out I was even worse than clueless. I then found the Knitting 101 series of videos by New Stitch A Day. They are wonderful. The instructions are slow, clear and perfect for someone like me. With the help of the video Knitting 101 : How to Cast On for Beginners, I was finally able to cast on my first row of stitches. This photo shows the results of my hour of overcoming my lack of hand-eye coordination. My plan is to spend Week 2 of the project mastering the knit stitch and starting to work on the body of the scarf. I am hoping to build up enough muscle memory that the stitching becomes automatic and that I am able to finish the stitching part while being a soccer mom over the course of a couple of weeks, and finally learn the binding stitch that is used to finish up the project. I hope you will follow me on my journey to knitting nirvana.